On the 14th and 15th of September, I was fortunate enough to attend the third workshop in the ESRC-funded Climate Ethics and Climate Economics series, entitled ‘Fat Tails – Imposing and Redistributing Risks’. The two days of workshops were accompanied by public lectures on the 13th and 15th of September by economist Professor Robert Pindyck (MIT) and philosopher Professor Steven Gardiner (University of Washington). The event brought together economists and philosophers to examine the issues arising from risk imposition in the context of climate change – a significant task in itself, but one that was certainly fruitful. Though I cannot here explore all of the papers, discussions and ideas that were raised throughout the conference, some themes did emerge. A central theme that emerged over the two days was the differences in approaches often taken by economists and philosophers, and the possibilities and the best methods of straddling the two disciplines. The prevalence of approaches such as Cost-Benefit Analysis (CBA) and Risk Assessment (RA) in economics-based approaches was often a locus of concern for philosophers, where in the context of climate change low-probability but high-impact risks can mean catastrophic outcomes. Nonetheless, several papers aimed to demonstrate the possibility of assuaging the philosophers’ concerns here from within the CBA framework. Simon Dietz’s intimidatingly-named but ultimately illuminating “Spaces for Agreement: A Theory of Time-Stochastic Dominance and an Application to Climate Change” began from the point of embracing disagreement over real-life time and risk preferences, demonstrating that in spite of such disagreement, broad agreement can be reached over the need to cut greenhouse gas emissions drastically even in the short term. The central claim was that only those with ‘extreme’ risk and time preferences would prefer not to cut emissions by a large amount. Though the maths in the paper was intimidating for those unfamiliar with the advanced methods used in economics (certainly myself included), its explication in presentation format was patient and clear. Jonathan Herington’s paper “Extreme Climate Risks and the Value of Security” aimed to demonstrate the value of security from three perspectives: welfarism, political liberalism and prioritarianism, where security was understood to be low variance in the probability distribution of access to basic needs. The value of security, it was argued, can be demonstrated by appealing to subjective (in)security (the belief one has about the securability of basic goods) and the effect of (in)security (the emotional responses such as fear and anxiety stemming from subjective (in)security). Security in this sense was deemed valuable in itself for welfare, and valuable for the political liberal in its role in helping individuals to form life-plans and pursue their conceptions of the good. As such, it was claimed that in CBA, we can have a reason to apply an ‘insecurity penalty’ to risky policies, giving a reason to prefer risk-averse options from within these parameters. Other approaches moved away from the traditional methodologies but were nonetheless firmly rooted in economics; Robert Pindyck, both in his public lecture “Climate (and other) Catastrophes” and his workshop paper “The Economics of Climate Catastrophes” explored expert elicitation as a mechanism for determining the ‘social cost of carbon’ (SCC). His argument was based on what he considered to be fundamental flaws in the methods used in creating Integrated Assessment Models (IAMs) in forecasting for climate change, giving them a false sense of scientific legitimacy. The results presented of a survey sent to experts (those with a high number of relevant citations) in both climate science and economics in the end determined a much higher SCC than used in a lot of current policy-making discussions. Pindyck’s further claim was that climate catastrophe, conceptualised as a massive drop in (a broad notion of) GDP, should be considered not on its own terms, but in relation to other possible catastrophes such as global pandemics and nuclear terrorism. Kian Minz-Woo’s paper, “Scouting the Risks Ahead: Expert Elicitation in Practice”, whilst being generally sympathetic to the project of expert elicitation, highlighted some of its potential pitfalls and some worries that it might raise. The anchoring effects of different disciplines, the role of social networks and demographic biases in academic circles and the possibility of overconfidence in forecasting were raised, but one of the central concerns that arose in the Q&A was the possible anti-democratic implications of such a methodology. Some of the papers did move away from the economics approach into more philosophical territory. 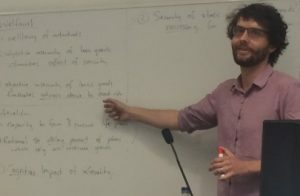 James Lenman’s paper, “Contractualism and the Ethics of Imposing Risk” examined some of the conceptual differences between ‘shared risk’ and ‘sacrificial killing’ cases that consequentialist accounts (arguably) seem to struggle with by teasing out intuitions through a range of thought experiments. The distinction between ex ante and ex post approaches helped to make the case that contractualism can differentiate between these kinds of cases through requiring reasonable justification at every stage. Eike Düvel’s paper “Rights-based Precautionary Approaches and Risk Imposition in the Context of Climate Change” examined some of the implications of a Scanlonian contractualist approach in the climate context, arguing that it can address the paralysis that would result from a ‘no-risk’ principle. Other papers stressed the importance of precaution in the context of risk-imposition and climate change. Our own Vera Van Gool, in her paper “Environmental Fat Tails: what have ecosystems ever done for us?”, made the case for taking socio-ecological resilience seriously, arguing on the basis of a virtue-ethical framework that a Precautionary Principle (PP) can be motivated for protecting natural systems even where there is scientific uncertainty over their ‘usefulness’ to mankind, but without arguing that we need to take a non-anthropocentric approach to justify this. In his defence of the PP in the workshop paper “Motivating and Expanding a Core Precautionary Principle”, Steven Gardiner argued that the differences between standard economic approaches and precautionary approaches need not stem from some ‘great theoretical divide’. He argued that there is often a debate about when the conditions relevant for applying the precautionary principle are met, and that some would argue that these can be determined through CBA approaches, but that what this demonstrates is that there can be good (indirect) utilitarian reasons for supporting the PP, and that debate as such need not stem from deeply rooted ideological differences. Steven’s public lecture, “Climate Ethics: Embracing Justice, Avoiding Extortion” took a perhaps less reconciliatory approach, making a decisive case for the importance of ethical consideration in the international negotiation over climate change policy. He contested the ‘realism’ in the ‘economic realist’ argument put forward by authors such as Posner and Weisbach, and demonstrated that such an approach can lead to legitimising extortion in the context of international climate negotiation. Though it may be the case that there are good reasons to think that the present issue of justice can have a bearing on the extent of the responsibilities we can have for engaging with climate change, such an economic realist argument does not have these at the centre. The importance of ethics and justice was put at the centre of the global climate change debate, and as such Steven’s lecture seemed an appropriate and motivating end to a great two days of workshops.